Beyond Redemption_Part 3_Were the War Criminals Repentant? After Gerecke had been selected to give Nazi war criminals spiritual counsel he decided to hold church services for them and to personally counsel those who were willing. In all, Gerecke worked with thirteen of the defendants. Gerecke was “in charge” to determine if the men were truly repentant for their crimes and whether or not he would allow them to return to their Lutheran faith. Once Gerecke determined that that they were repentant he allowed them to partake of the Lord’s Supper as a sign of their repentance. Whatever else we might conclude about the possibility of redemption for Nazi war criminals it is clear that Pastor Gerecke believed it possible and the organist would have been Gercke’s Exhibit A. 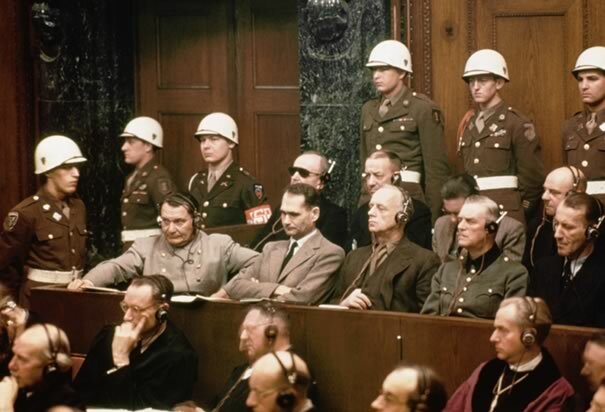 Some of the defendants at Nuremberg guarded by American Military Police. My father was a MP stationed in near by Cologne at the time of the trial. Here is sampling of what happened with some of the defendants Gerecke ministered too. –Karl Donitz-head of the German Navy after Raeder, received 10 years in prison. Donitz believed Gerecke could help him after Gerecke told him they would simply deal with the Word of God in relation to the hearts of men rather than a political debate. In other words Gerecke stuck to the gospel and that opened the door for him to speak with Donitz. Donitz responded with repentance according to Gerecke. –Hans Fritzsche headed the news division of the ministry of propaganda under Joseph Goebbels. Fritzsche was acquitted. Gerecke believed Fritzsche to be repentant. Most of the defendants believed they all would receive the death penalty from the vindictive allies. However, the allies (the western ones anyway) wanted justice to be served above all else and if there was not enough evidence to convict Fritzsche then an acquittal was appropriate. I think that given the attitudes of the time it must have been a hard decision for the judges to make and it would have been easier to convict Fritsche and give him a light sentence like the one Donitz received. –Herman Goering was the highest ranking Nazi to be tried. Goring was head of the German Air Force (Luftwaffe) and was Hitler’s designated successor almost to the end when he fell out of favor. 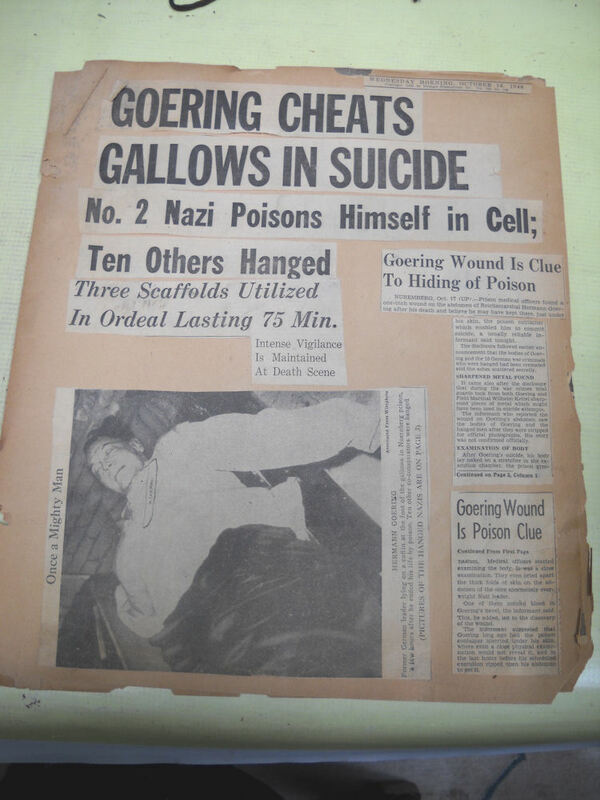 Goring’s sentence was death by hanging but he committed suicide the night before the execution. Gerecke was one of the first to get into Goring’s cell the night he killed himself. Gerecke never believed Goring repentant and refused him communion. In the book Goring comes across as extremely personable especially to Gerecke whom he loved to chat with. Gerecke suspected Goring of game playing perhaps hoping for an acquittal or light sentence. Goring also comes across as delusional in the book. He is shocked that he is not treated with the respect he thought he was due. Gerecke also ministered to the defendants families if they let him), Gerecke ministered to Mrs. Goring and their young daughter. Gerecke took the example of Jesus seriously as he would minister to any sinner who wished him too. Herman Goring, death by cyanide capsule. –Alfred Jodl was the General who was Chief of Operations for the German Wehrmacht. In his capacity as Chief of Operations he was the second highest ranking general after Keitel and Hitler’s closet military advisor. Jodl’s reputation was that of a sycophant and a yes man never standing up to Hitler’s often ludicrous military decisions. His sentence was death by hanging. Jodl had pled “not guilty” and said, “For what I have done or had to do, I have a pure conscience before God, before history and my people.” His not guilty plea speaks of his lack of repentance and a sense of false assurance. Jodl would have used the “I was only following orders” defense offered by many of the Nazis. — Ernst Kaltenbrunner was a high-ranking SS officer who had responsibility for the death camps. Kaltenbrunner was an unrepentant psychopath and had no use for Gerecke. There is a whole chapter in the book detailing his crimes and frankly it is as appalling as a visit to Auschwitz-Buchenwald. Kaltenbrunner was a Nazi to the nth degree apparently without any conscience what-so-ever. In my opinion he received justice in this life (death by hanging) and would receive justice in the life to come for his lack of repentance. –Wilhelm Keitel was head of the German Army and like Jodl a chief military advisor to Hitler and like Jodl considered to be a yes man by many other generals in the Wehrmacht. Keitel was a bit of surprise at Nuremberg. At first he refused to admit any guilt like Jodl but at the end made no excuse for what he was responsible. Gerecke believed him to be repentant and Keitel faced the gallows with some dignity and military bearing. –Konstantin von Neurath was minister of foreign affairs for Hitler. He received fifteen years in prison for his crimes. Von Neurath was initially unresponsive to Gerecke but Neurath’s family thanked Gerecke for helping him “get right with God.” Neurath was one of the five Catholics so it is apparent that both Gerecke and O’Connor ministered to him at some point during the trial. –Erich Raeder was head of the German Navy prior to Donitz. He received life imprisonment for his role as Hitler’s naval advisor up until 1943. Raeder was skeptical about certain Christian tenets and Gerecke at first considered him an intellectual skeptic regarding Christianity but later believed Raeder was more suspicious of the American Army than he was of Christianity. Raeder became an ardent Bible reader and one of Gerecke’s best students. Gerecke believed Raeder returned to the Lutheran faith. Although Raeder received a life sentence he was released from prison in 1955 due to poor health. –Joachim von Ribbentrop was another minister of foreign affairs. His sentence was death by hanging. Von Ribbentrop was unrepentant at the start of Gerecke’s ministry. His wife was even more adamant in her opposition to Christianity. Both were ardent Nazis. Later after reading the Bible and the Lutheran Catechism von Ribbentrop became penitent and right before the end of the trial he asked to take communion which he did indicating that Gerecke believed him to be repentant. –Alfred Rosenberg was a racial theory ideologist and minister of the eastern occupied territories. As the minister for the eastern conquered territories he was responsible for the death of perhaps millions. His sentence was death by hanging. Rosenberg told Gerecke he had no use for his childhood faith but added he believed in God, but not Christ. This was a reflection of Gottglaubige or “believers in God.” Certain Nazis didn’t want to be Christians but also wanted to distinguish themselves from atheists. –Fritz Sauckel was the planner of the Nazi slave labor program which killed hundreds of thousands. His was the Reich’s Labor Minister and his sentence was death by hanging. Sauckel became the first to work seriously with Gerecke. He saw himself as a person who did no wrong against God or man even though he was responsible for the slave labor that killed many. According to Gerecke Sauckel did eventually repent crying out so loud that every guard on his floor heard him say “Gott sei mor gnadig, ein Sunder,” God, be merciful to me a sinner. Sauckel then helped with other men including Speer, Fritzsche and Schirach all of whom Gerecke believed returned to faith. –Dr. Hjalmar Schacht was a banker and industrialist. He was acquitted. He objected to being tried with the likes of Goering and Kaltenbrunner and because of that association believed he was unfit for communion. He told Gerecke that once he was declared a free man he would take his wife back to church and partake of the Lord’s Supper. Gerecke did not render an opinion as to Schacht’s repentance. What is interesting to me is Schlacht’s sense of self-righteousness in being associated with “worse” sinners like Goring and Kaltenbrunner. Schlacht played the game that many of us play by comparing ourselves to other sinners rather than comparing ourselves to the sinless Son of God. Gerecke was asked later if the men who he thought repented did so simply because they would meet their deaths on the end of the rope. The apostle Paul considered himself to be the chief of sinners. In other words, only God knows for sure the inner workings of man’s heart. In the next installment I will work through many of the relevant Scriptures. From Hitler’s Wolves to Christ’s Lambs, an article from the Gospel Coalition on Gerecke and Nuremberg. 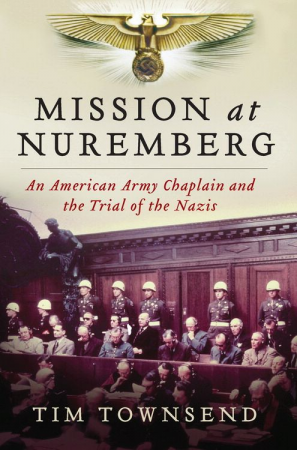 This is part one of a series derived from my reading of Mission at Nuremberg, An American Army Chaplain and the Trial of the Nazis by Tim Townsend. For those with an interest in theology and history I cannot recommend this book enough. To say that it is thought-provoking would understate what Mr. Townsend has accomplished in telling Pastor Gerecke’s story and his ministry to hardened war criminals. There are many angles to the story that I could have focused one but I chose to focus on what I believe is the central proposition-Could a hardened Nazi war criminal find redemption at the Cross of Jesus Christ? In 2007 on a mission trip to Poland we took a side trip to Auschwitz-Birkenau. Although I was familiar with Nazi death camps and intellectually understood the horror of a death camp it’s something quite different to actually visit one and experience it. Seven years after our visit I still remember the small courtyard where prisoners were lined up against a wall and shot, by the hundreds, just because of some small infraction of camp rules or because they were no longer useful for work. You can see where the bullets chipped away the masonry as the shooters sometimes missed their target. The target area today is covered by a large wreath that serves as a memorial to the victims. When you enter the small courtyard you stand where the executioners stood with their rifles and you look directly at the wreath and the chipped masonry. It’s a courtyard of death and only the beginning. The court-yard is just past the gallows where hundreds more were killed as examples because of some infraction. Graphic pictures tell the story as you realize real people were hung right where you are standing. The trip between the buildings can only be described as a house of horrors as you realize what took place. You wonder, how could this happen? Then you enter some of the buildings which have been turned into a museum. You pass display rooms full of luggage symbolizing the trains that rolled into Auschwitz-Birkenau on a daily basis and the people who would never leave. To this day the wall mural of small children leaving the train haunts me as you realize tiny children were killed in the hundreds of thousands. How could this be you wonder? How could anyone be so cruel to their fellow human beings? Then you pass rooms full of eye-glasses and rooms full of human hair and tooth fillings. The Nazi’s accumulated numerous items taken from the prisoners to help them in the war effort. To the Nazis their victims were not human, but sub-human, useful only for work or the “products” they could scrounge once their victims were gassed. And then you reach the crematorium, the only one left standing. 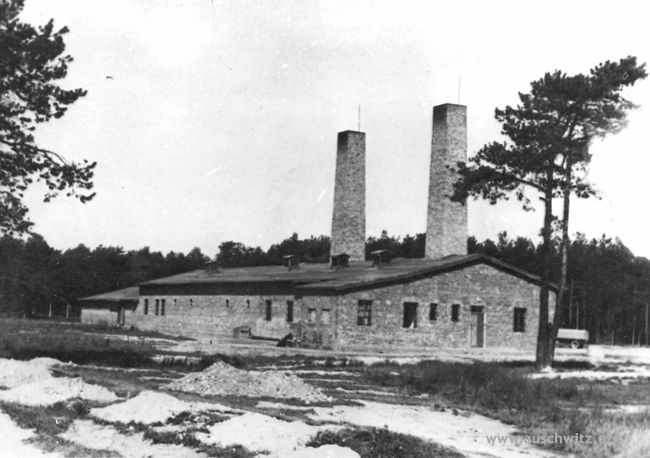 As the Russian Army approached the Nazi’s fled blowing up the crematoriums leaving one furnace only partially destroyed. You walk into the furnace after first walking into the showers where Zyclon B was administered. Millions went to their deaths in this way throughout Germany and Poland. 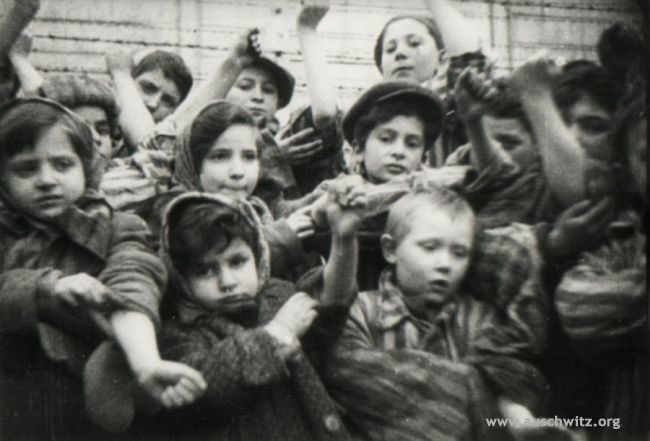 How could this be as you realized over 6,000,000 perished in the death camps. Eventually the tour gets more personal and if you are a thinking, reflective type person you begin to wonder how in the world could this even happen in what was thought to be a Christian Europe? You wonder about good and evil and you wonder what kind of monsters could perpetrate such horror seemingly with no regrets and no conscience. You wonder how a so-called “Christian” nation could collectively conspire and/or allow a regime so evil to murder over 6,000,000 people. It boggles the mind as you struggle with man’s inhumanity to man. As an American of primarily German extraction those kinds of questions haunted me. Did I have the same DNA the German Nazi’s did? It’s a horrifying thought. I was born in the USA 90 years after my paternal great-grandfather came here from Prussian Pomerania. I see that as God’s providence but the flip side is had he not done so my father and mother and grand parents could have been part of the holocaust in some capacity. This too was a terrifying thought. It is true that not every German was a Nazi but realizing that your family could have been is a sobering thought. My answer to that as pastor is don’t be so sure, nor so self-righteous as to think you lack the capacity for every kind of evil. Consider what the Scripture says before you assume that horrendous evil could never be on your radar. When Scripture uses the word “heart” it usually means not the “cardia” but the center of the human will and emotions-the inner man, who we are on the inside. The unconverted heart (to Christ) is deceitful and crooked, quite bumpy like a very bad road and desperately sick meaning medically incurable. It is not a pretty picture of the human condition and it flies in the face of people who seem to believe that mankind is “basically good.” A trip to Auschwitz-Birkenau should change that impression pretty quickly. Paul is giving us bad news. The unconverted follow the course of a sinful world, following the prince of the air whether they know it or not and whether or not they seem “good” by human standards. Paul says that the converted all once lived like that, in the passions of the flesh and quite willing to carry out those passions; passions that can be and are, quite evil. Paul says, we were children of wrath (the wrath of God) just like the rest of mankind. We may choose to not believe that; but it is what Scripture says and means. It ought to be sobering to consider our unconverted nature before we seek to judge someone else’s unconverted nature. I am referring to what’s called the doctrine of total depravity. The doctrine of total depravity means we do not commit all the sins we are capable of committing. It just means we all have the capacity to be the worst of monsters, like the Nazis who mapped out the holocaust and executed it the best they could before being stopped. That should be sobering if you value the teaching of Scripture. So, what happened to the Nazis? How could a so-called Christian nation (most Germans were either baptized Lutherans or Catholics) fall into some of the worst kinds of depravity recorded in history. A philosopher by the name of Hannah Arendt can give us a little insight. Hannah Arendt was a political philosopher who lived from 1906-1975. She is most famous for her “banality of evil” comments she made in observing the trial of Adolf Eichmann. Eichmann was a major architect of the holocaust who had escaped to Argentina after the war. In 1962 the Israeli Mossad grabbed him out that country and brought him back to Israel for trial. The trial was an international sensation and although I was only nine-years old I remember it because even then I was reading my dad’s books like William Shirer’s Rise and Fall of the Third Reich. Here are two paragraphs that outline her philosophy coming out of the Eichmann trail. She controversially uses the phrase “the banality of evil” to characterize Eichmann’s actions as a member of the Nazi regime, in particular his role as chief architect and executioner of Hitler’s genocidal “final solution” (Endlosung) for the “Jewish problem.” Her characterization of these actions, so obscene in their nature and consequences, as “banal” is not meant to position them as workaday. Rather it is meant to contest the prevalent depictions of the Nazi’s inexplicable atrocities as having emanated from a malevolent will to do evil, a delight in murder. As far as Arendt could discern, Eichmann came to his willing involvement with the program of genocide through a failure or absence of the faculties of sound thinking and judgement. From Eichmann’s trial in Jerusalem (where he had been brought after Israeli agents found him in hiding in Argentina), Arendt concluded that far from exhibiting a malevolent hatred of Jews which could have accounted psychologically for his participation in the Holocaust, Eichmann was an utterly innocuous individual. He operated unthinkingly, following orders, efficiently carrying them out, with no consideration of their effects upon those he targeted. The human dimension of these activities were not entertained, so the extermination of the Jews became indistinguishable from any other bureaucratically assigned and discharged responsibility for Eichmann and his cohorts. Arendt concluded that Eichmann was constitutively incapable of exercising the kind of judgement that would have made his victims’ suffering real or apparent for him. 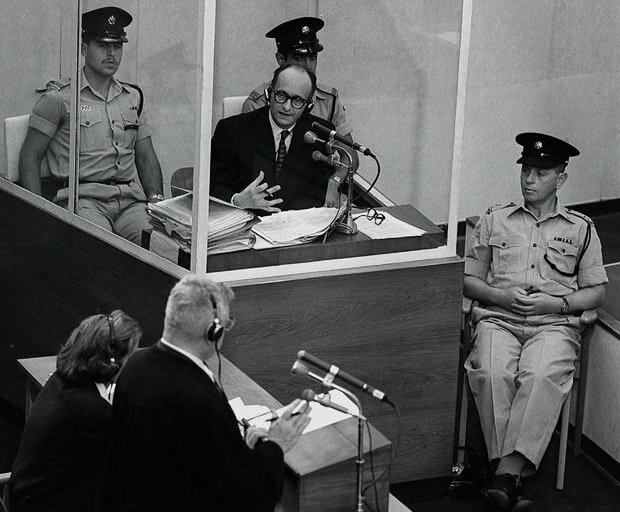 It was not the presence of hatred that enabled Eichmann to perpetrate the genocide, but the absence of the imaginative capacities that would have made the human and moral dimensions of his activities tangible for him. Eichmann failed to exercise his capacity of thinking, of having an internal dialogue with himself, which would have permitted self-awareness of the evil nature of his deeds. This amounted to a failure to use self-reflection as a basis for judgement, the faculty that would have required Eichmann to exercise his imagination so as to contemplate the nature of his deeds from the experiential standpoint of his victims. This connection between the complicity with political evil and the failure of thinking and judgement inspired the last phase of Arendt’s work, which sought to explicate the nature of these faculties and their constitutive role for politically and morally responsible choices. Much of Arendt’s work revolves around the ideas of thinking and judgment. To apply this to Eichmann she would have concluded he didn’t believe what he was doing was morally wrong and that sort of thinking made his judgment rational to him. I believe her assessment is biblically accurate. An assessment like that fits the biblical data that the inner man is badly damaged, medically incurable as Jeremiah 17:9 would say. In other words Eichmann’s unredeemed heart became so hardened he was immune to compassion and moral categories seemed irrelevant to him. Eichmann’s conscience was seared and his heart hardened just as Pharoah’s heart was hardened in Exodus. Some would say that Eichmann was mentally ill but the Bible would say he had a hard heart. In other words, our actions, attitudes, behaviors, speech and so forth come from the inside out and are dependent on what we treasure. Eichmann saw himself in terms of wanting of being a well-thought of bureaucrat. He aimed to please Hitler and his superiors even if that meant supporting genocide and extermination of those the Nazis deemed undesirables. Eichmann did not fear God and so he had a hard heart. His passion was pleasing his superiors. His idol was the affirmation he received from the accolades associated with pleasing them. I would submit that Eichmann’s example fits the profile of many a Nazi. There wasn’t anything particularly evil about Eichmann or anyone else in being German that enabled the holocaust. A thoroughly hardened heart is capable of every kind of evil. When someone goes on a killing spree in modern America we see the hardened heart in action. It differs only in scope and magnitude to what the Nazi’s did. So what hope do any of us have. Jeremiah 17:10 gives us a clue. The passage means that only God understands the inner recesses of human motives, thinking and decisions (ESV Study Bible). In other words without God we cannot grasp the depth of our own depravity and our desperate need for a Savior to do some heart surgery! 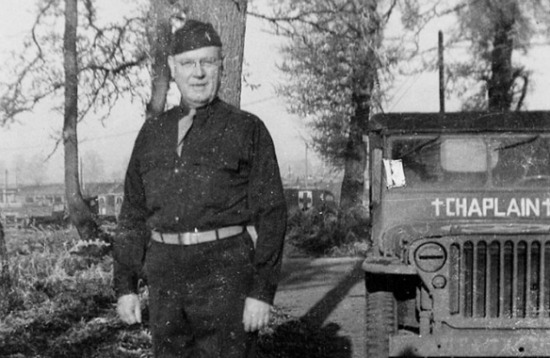 Much of the above has come to my mind again as I read through the story of Pastor Henry Gerecke a Missouri-Synod Lutheran pastor/Army chaplain who was given the job “of saving some” of the Nuremberg defendants-the most evil among the evil. As far as I know Eichmann never repented but what if he had? 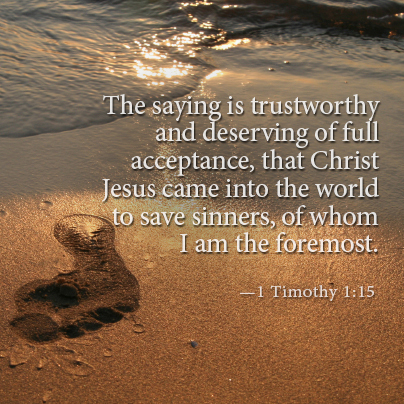 Would God have forgiven his sins and judged him with mercy? For some, that is an impossible thought and I certainly understand the emotion but then again I think of the story of Corrie Ten Boom who could and did find forgiveness in your heart when she recognized one of the SS guards at a church where she was giving her story. To answer our question we must consult the Scriptures. The UKs Daily Mail did a major story on the release of the book. I’ve linked it here. Interesting link titled 30 Worst Atrocities of the 20th Century. The author makes the important point that atrocities are not limited to a particular nationality, a particular religion or a particular type of government. The only difference in the listed atrocities is the scope and scale of each. In other words the capacity to commit atrocity is a universal human problem.